Until the 1960's our conception of the Island and how we live on it was governed by our knowledge of its 6,000 miles of coast. The railway "opened" the interior of the Island nearly 70 years before, but it didn't really change our perception of our geography which had developed over the course of four centuries. People in government and business "knew" only a coastal view of the Island and considered the interior a "meta incognita" of vast resources and mysterious potential. Until we "completed the drive in '65, thanks to Mr. Pearson" wholesalers and shippers still operated fleets of coastal steamers and schooners to supply the coasts of the Island and Labrador. Labrador is still "coastal", which is about to change with a new network of highways in southern Labrador eventually connecting to the trans-Labrador highway through western Labrador and on into Quebec. Even today there are fewer than 40 communities without immediate access to salt water. An 1892 handbook included the sailing distances from St. John's to Bonne Bay ("The Capital of the West Coast"). Comparing them to a modern highway distance table from a "tourist map" there is an obvious loss of "linearity" and, consequently, some sense of discontinuity. The "stately" progression of a coastal steamer has given way to the frenetic haste of the automobile; the trip has become a barely tolerable "nuisance" rather than a life experience. 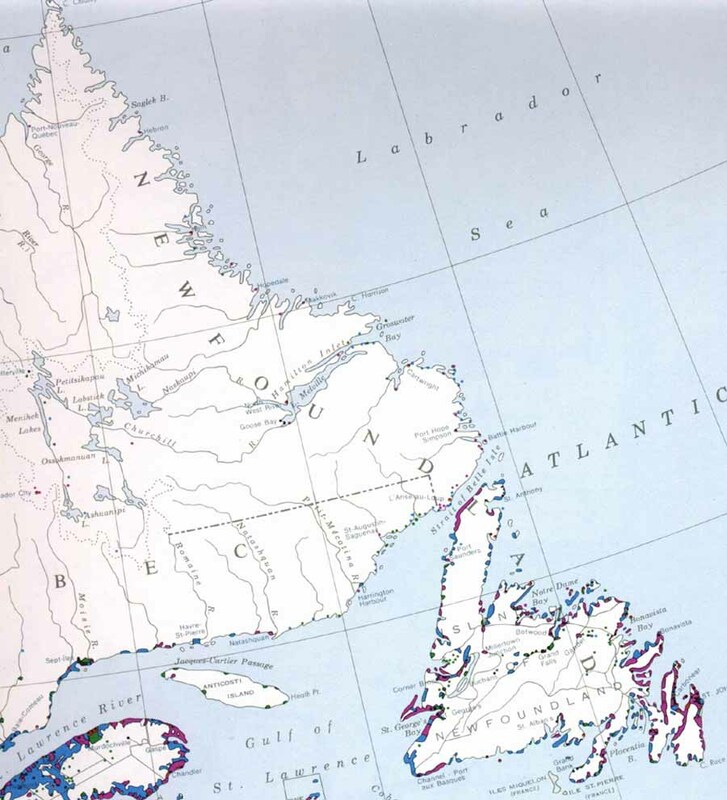 Two map sections taken from The National Atlas of Canada (1974) emphasize the coastal aspects of our social geography. The first shows the 1941 distribution of population for Newfoundland. Each red dot represents about 1,000 people and the circle around the northeast Avalon, centered on St. John's represents 40,000 people. The map is on pages 93 and 94 of the Atlas. 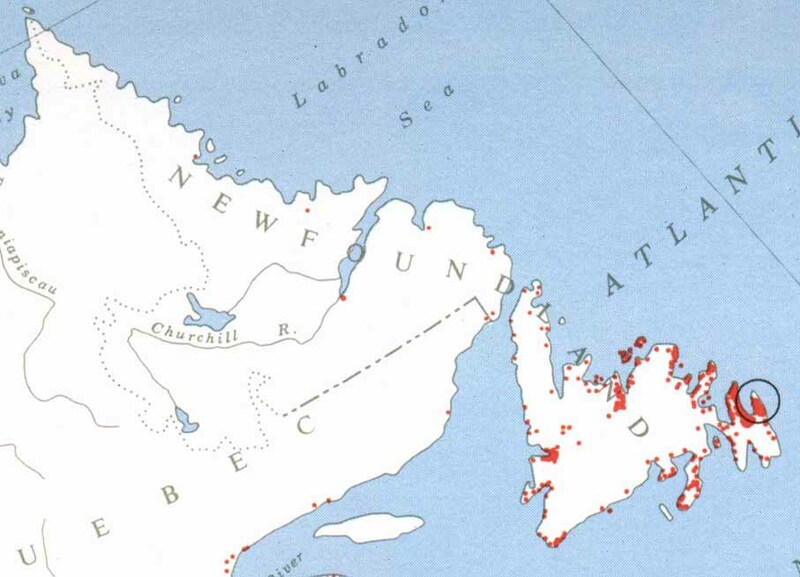 The second map section from the National Atlas of Canada pages 105-106 shows the 1961 population density.